0.0 6:40 Leave. I am on my way to Vancouver. The sun is not shining today; in fact the sky to the south looks quite dark and ominous and maybe there’s going to be a storm during the day. I originally started to leave at 6:30, then realized I needed water and had to fill up the water jug. Then I wanted to take a picture of the Texas Ranger at the front and so I left at 6:40. I still have not decided on which route I’m going to take other than I’m not taking the dirt road through Utah. I will save that for another time. This is the third time of driving between Tucson and Phoenix since last Thursday, when we went to the airport to meet Auntie Rose and Pete. We took them back on Sunday, and now this is Wednesday and I’m doing the same route again. There’s a lot of traffic on the road but not excessive. However I imagine it will be heavy when I get to Phoenix because of the hour. 45.0 Exit-203. This is at Toltec and between Eloy and here I’ve seen police both sides of the road with stopped trucks. I’m glad that trucks get stopped as well as cars because they seem to rule the road so often and their speeds can be excessive. 47.4 Another truck stopped by a policeman. 66.4 7:37 - 7:40 Rest Area to look at the map. 104.0 8:18 and now the amount of traffic has increased again, but still moving along smoothly. 122.0 Passing Exit-7, the Glendale Avenue exit. 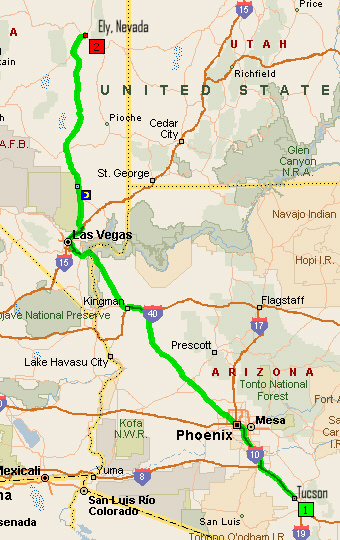 I will be leaving AZ-101 at Exit-11 for US-60 and US-93 to Kingman. 126.4 8:38 Left US-101 at Grand Avenue. 127.3 Sun City, El. 1,150 feet. 129.7 Crossing the Aqua Fria River. Immediately after crossing the river, entered the next town, El Mirage, El. 1,178 feet. 131.6 8:47 Entering Surprise, founded 1960, El. 1,200 feet. 133.2 Crossing Bell road. There seems to be lots of traffic and I am progressing slowly. 137.6 8:56 Speed increased to 65 mph. So far this road has only been noted as being US-60 which will go into Wickenburg where it turns west to join I-10 shortly before Quartzsite. 144.2 Entering Wittmann ... crossing Arizona Project Canal. I have not noticed any signs so far indicating the distance to Wickenburg. 146.3 9:04 Wickenburg is 20, Kingman 147. There are quite a lot of saguaro cacti coming this way towards Wickenburg, old and large ones. 163.7 9:20 Right lane closed and speed reduced to 25 mph as I approach Wickenburg. 165.8 Junction with AZ-89 and US-93 in half a mile. 166.0 9:35 Leave McDonald’s, Wickenburg (Pit stop and coffee). 166.2 US-93 normally goes to the right here and US-60 follows a roundabout, but I’m still following US-60 at the moment, a detour for US-93. A lot of road construction is under way in Wickenburg. 168.1 End of the construction. 172.9 Passing the turnoff for AZ-89 to Congress and Prescott. 173.4 Kingman 121 miles. A sign: Watch for animals the next 144 miles. Leaving Wickenburg, the countryside is not quite as hilly, but it’s surrounded by mountain ranges. The predominant shrub across the countryside is the creosote; there are also some prickly pear and cholla, not the teddy bear ones, also some yucca. The prickly pears have a lot of fruit on them and the yuccas have already flowered. 183.4 Exit for AZ-71 to Prescott and Los Angeles. 184.6 Joshua Forest Parkway of Arizona, but so far no sign of any Joshua trees. 186.4 Spotted a couple of Joshua trees and a few more ... starting to see them now, some very nice specimens, too, and there’s still the odd saguaro to be seen. 190.0 The rood is back into hills and I am seeing a lot of Joshua trees. There are as many Joshua trees here as there are in Joshua Tree National Park in California. There is literary a forest of them. 199.0 The area is more mountainous now, but out to my right are two hills which are flat on top, so they could be called mesas. 202.9 A lonely saguaro among the Joshua trees. 203.9 Interesting rock formations in the valley to my left - like individual large rocks standing solitarily in the valley. At that point the road is descending into a valley ahead and I can see the road climbing up the mountain range on the other side of the valley ... a lot more saguaros on the hillside and not as many Joshua trees. 208.7 Some ocotillo in the medium ... after the bridge the road became a 4-lane divided road. The saguaros to the right of the road are all propped up with wooden poles, about three pieces per cactus. 209.4 Start of a large cutting as the road winds or snakes up the hill. 209.6 Crossing Cottonwood Canyon, and it looks to me as if this is a completely new piece of road and old US-93 could be somewhere else. 211.9 Passing the turnoff for AZ-97 to Bagdad. Kingman is now 82 miles. 215.5 A different kind of yucca, (I think the others are the soap yucca). The leaves of these ones are down low to the ground, and they’re flowering at the moment, a very full flower head on a long stalk. 216.1 Driving through the rocky area where there is a rock that was called Pluto, I think. That’s the one on the left - it’s a rock sitting on top of another rock, and is the shape of a dog’s head. I’m at an elevation of 3,176 feet. 217.3 A saguaro with a lovely flower on it still. 217.8 3,287 feet - the crest before starting a 6 % downgrade for 3 miles. Ocotillo flowering. As the road descends, the hills are covered in huge boulders. 221.2 Some of the rocks that you can see on the hillside look to be quite black as if they’re ancient lava beds. 222.2 Straight ahead of me is a bridge across a ravine or a canyon, but I don’t know if that’s where the road will finish up or not, but I can see it away ahead. 223.7 Another brief glimpse of the bridge and to the left a canyon going out through the hills, a canyon with vertical rocky cliffs. 225.7 10:32 Pulling off for the Burro Creek Campground, as I would like to get a couple pictures here. 227.3 Picture of the bridge before I turn back to the entrance to the campground. 227.7 As I leave the campground I am turning right - towards another bridge across the creek. There is water in Burro Creek. 229.2 10:55 Back at the highway, that is US-93, and continuing northwest. 230.2 Starting to cross the Burro Creek bridge, the bridge I originally saw. There is a canyon to my right and it is winding around in the hills. 234.3 Kaiser Spring Wash - Start of a curved bridge over the wash. The mile posts here are in descending order ... have just passed 133, and I am wondering if that’s 133 miles to the Nevada border and the Hoover Dam. (237 + 133 = 370 ... it will be interesting to see if the trip mileage is 370 we I get there. 237.4 A turnoff for Burro Creek Crossing, which is off to the right. 237.9 Crossing Box Canyon Wash.
240.3 Interesting hoodoo type erosion to the right of the road as it drops into another valley..
242.6 Starting to cross Big Sandy River and there's actually a little water in it. 243.3 Sign for the end of the Scenic Parkway. I don’t know whether that means the Joshua Tree Parkway or what ... just said end and had the kind of a sign used for scenic byways. 244.2 Speed reduced to 55 mph and road down to one lane - end of the divided highway. 245.0 Two-way traffic and now the speed is 45 mph. 246.2 There’s some kind of orchard to the left, and I’m wondering if it’s pistachios or not. They look a little like pistachio trees but are too far away to know for sure. There are a few Joshua trees growing here in Wikieup. 247.5 11:15 Leaving the Big Sandy Valley Historical Marker. 248.6 Start of two-way traffic ahead. A lot of native plants that have been planted in this area, and you can see the black hoses that are being used for drip watering. 251.5 11:19 Kingman now 46 miles, Las Vegas 148 miles. 274.7 A turnoff for old US-93 and there seems to be a number of houses in this area. There are signs for lots sold by Silverado , so there’s some kind of development in this area. 277.2 Over a crest and I can see the traffic on I-40, in the distance that is. 278.6 Junction with I-40 half a mile ahead and two-way traffic begins - the end of the divided highway, speed limit 45 mph. 279.1 This is interchange 71. 279.4 Just crossed the highway and am on a big curve for the junction with I-40. 280.1 11:45 Junction with I-40 and the speed limit is 75 mph, Kingman 20 miles, Las Vegas 115 miles, and Los Angeles 368 miles. 286.0 My ears just clicked and on checking elevation on the GPS , it is 4,068 feet and rising. 293.9 11:55 Kingman City Limits, and when I leave the interstate for US-93 north to Las Vegas, I will get gas. 295.5 First sign for no trucks on US-93 over the Hoover dam. 301.3 Passing the steep rocky outcrop on the mountains or hills. This is what I remember of my trip way back in 1960. I’ll be leaving the interstate at Exit-48. 302.3 12:02 I am choosing the best spot to get gas, Gas Express, because further along Shell and others are 20 cents more per gallon! 304.8 Lots of strange rock formations, left after erosion. 305.0 Coyote Pass, El. 3,737 feet ... there was a sign at the side of the road to the effect that no trucks, rental trucks, buses, or trailers are permitted over the Hoover Dam. 307.0 Hoover Dam 67 miles, Las Vegas 97 miles. 312.8 The tailings or sludge of a big mining operation back in the mountains to the right. 313.5 Lots of cholla across the landscape. 315.2 12:26 Leaving Mineral Park Historical Marker. 321.4 Passing the Historical Marker for Chloride. I am thinking that I better not stop at all these markers because I want to make good mileage today. 325.0 The main vegetation now seems to be creosote. The road is traversing a wide valley between mountain ranges. 336.0 I see a Joshua tree. There are quite a number of houses or trailer homes scattered through out the valley. 347.2 A house that looks as if it was built underground ... you can see the windows at the front, but the roof is level with the land at the back. 352.3 The road has veered over to the left side of the valley and, at the moment, I’m right at the foot of deep brown-reddish, very rugged, rocky mountain tops. I never know whether to call them mountains or hills, but I guess it’s part of a mountain range. Speed is being reduced and the road is going to have the left lane closed. 357.0 Speed reduced to 45 mph Monday through Friday - expect delays ... the road is down to one lane. 357.6 Two-way traffic. A big sign at the side of the road: Welcome to Lake Mead National Recreation Area. 358.2 Do not pass the next 14 miles. Construction is under way for making the highway a divided road ... you can’t see it way below the current road which means a huge engineering task of building viaducts across the valleys. What a monumental construction job! To my right are cliffs which have been carved for the road that I’m on and this is near the turnoff for Lake Mead National Recreation Area at Willow Beach. On a previous trip I drove down to Willow Beach to have lunch, something I could have done today except I don’t want to take the time. Building the new road is a very monumental job; it is to the left of and downhill from this one, crossing many gullies and ravines. 361.2 Just got a quick glimpse of the Colorado River in the bottom of the canyon. The scenic viewpoint is closed, as it is being used during the construction project and is filled with construction material. 364.0 Now the heavier equipment is to the right of the road and work is being done where, on previous trips I have mentioned cuttings which I thought might have been either an earlier road or maybe at one time railway tracks. It would appear that perhaps those old cuttings will be utilized for part of the new road. 370.0 Now the construction has switched back over to the other side again. 372.9 Going into the police check point. 373.7 1:25 - 1:29 Pulled up at the first parking area above Hoover Dam. The water level is so low. The traffic going across the dam is stopped, so it will be slow going until I’m across. 374.2 1:32 - 1:36 Stopped again for more pictures and a good view of the arch of the new road. Almost immediately after pulling out from that parking spot I’m in the slowly moving, stopped or partially stopped traffic. 375.5 1:45 Welcome to Nevada sign. 376.7 1:52 - 1:54 Lake View Lookout. It is extremely windy here and I’ve decided not to stop to get anything out of the trunk. Hopefully it won’t be as windy at the Lake Mead Recreation Visitor Center. Ocotillo blooming as I approach the stop sign for rejoining the highway. 377.0 1:55 Back on US-93. I’ll stop at the visitor center so that I can use the rest rooms there and get something out of the cooler to eat. 379.5 Turning off US-93 for the Allen Bible Visitor Center for the Lake Mead National Recreation Area. 380.0 2:01 - 2:17 Alan Bible Visitor Center, Lake Mead National Recreation Area. I stamped my National Park passport, used the washroom and I got out some food. I also got a good map of Nevada and if I was going further on I-15 I could have driven through the park but I’m turning off on US-93 so I have to go via Las Vegas. It is a hot day. 380.5 2:19 Back on US-93. 381.6 Welcome to Boulder City. 406.3 2:45 Sign at the side of the interstate - Las Vegas, El. 2,165 feet ... 3½ miles to I-15. The sound barrier on each side of the interstate has a beautiful design in it, some kind of a tree and a cactus and maybe small pebbles for the ground. It is hard to make out exactly what it is but it’s in green, beige and blue, blue for sky, browns for the ground and different greens for the shrubbery and cacti. 409.9 Right near downtown. 1 mile to I-15 and US-93 north. 410.7 2:51 Leaving I-515 for I-15. 420.5 The speed has now increased to 75 mph ... 11½ miles to junction with US-93 north. 427.6 401 miles to Salt Lake City. 428.1 Apex Summit, El. 2,492 feet. US-93 goes to Pioche and Ely. Alamo and Caliente are places along this highway. I noticed a sign for Great Basin National Park, Exit-64, which is also the exit for US-93, called The Great Basin Highway. 432.6 3:11 Left I-15. Two-lane road and the speed is 70 mph. It hasn’t told me yet how far it is to any of these places. The road looks to be flat but every now and again the car revs up a bit which means it’s climbing ... some yuccas and a few Joshua trees. 439.0 A sign by the Department of the Interior at the side of the road: Area of critical environmental concern. I can see all the strata in the mountains as they have tilted and I would say tilted from the west to the east so that the rugged slopes are facing west and the flatter slopes are to the east. According to the GPS all the land to the west of the road is green, a little lighter than the green for National Parks. The area is the Desert National Wildlife Range. It’s strange there hasn’t been a single marker for anything other than the speed limit of 70 mph, no distances to anywhere, no names of anything just a stretch of road forging down the valley. 462.0 First signs of some habitation ahead and to the right a sign for Alamo, also Coyote Springs. 464.4 Alamo 43 miles, Caliente 97 miles. 475.8 Passing the turnoff for Alvin, 38 miles - a gravel road. For the most part the road is almost perfectly straight and going along the valley between mountain ranges. Now I can see where the green part is ending, that is the Wildlife Range. To the west of that is a big grey area, which is of course military. Just off I-15 at the previous exit from this highway there was an Air Force Base, where there are lots of testing grounds. It is a huge grey area. 491.0 Leaving the valley and going into the hills or mountains, road winding or climbing for the next mile ... going through cuttings. Entering into the canyon or cutting. 492.3 Entering Pahranagat National Wildlife Reserve. The Pahranagat National Wildlife Refuge, approximately 90 miles north of Las Vegas in Lincoln County, Nevada, is located in the Pacific Flyway, and encompasses 5,380 acres. The name, Pahranagat, comes from the Pauite Indian word meaning valley of shining waters. Established to provide habitat for migratory birds, especially waterfowl, the refuge is a unit of the Desert National Wildlife Refuge Complex. It is quite green, with mountains coming right down to the flat green area, where it looks as if there might be a stream running through. Alamo 15 miles, Caliente 69 miles, Ely 206 miles. 493.5 Opened out into a basin. 494.2 Sign: Major deer crossing ahead. Sign for wildlife viewing area. There’s a lake to the left of the highway, Lower Pahranagat Lake, quite a big lake, it’s not huge but it’s certainly bigger than a pond. 497.3 Passing a shady picnic area with a picnic table. The valley to the left is quite green and would be a great area for wildlife. 499.7 Little Marsh Wildlife Viewing Area - Another sign: major deer crossing ahead. 502.7 Another major deer crossing ahead and large marsh lands to the left of the road. Upper Pahranagat Lake. 505.0 A number of houses in the area, horses and ranching - I think this is about the area of Alamo, but there’s nothing as far as the town is concerned along the road. 507.1 Entering Alamo El. 3,450 feet. Alamo Nevada is a rural town in Lincoln County, and is home to the Pahranagat National Wildlife Refuge, and many American Indian petroglyph sites can be found. 507.4 4:15 Leaving, after stopping for the Historic Marker - “Pahranagat Valley”. 508.1 Some cows grazing in green fields and some are just lying down resting. 514.4 4:28 Entering Ash Springs, El. 3,630 feet. There’s a gas station here, too, a Shell, which is 10¢ more per gallon than where I got gas at the Sinclair station in Alamo. 515.2 Lots of head cattle to the left as I leave the town. This is a very beautiful valley with all the green grass and lots of cattle; there also seems to be lot of water lying around as if there has been rain or there are natural springs. 519.9 4:34 The junction with NV-375, which goes northwest to Warm Springs and NV-318 to Ely (134 miles). US-93 turns east to Caliente before turning north through Pioche and Ely (177 miles). I am going to take NV-318 north. There are big trees here, and picnic tables under the trees. 520.6 Ely is 134 miles and it is a hundred miles to the next gas station. Sprinklers are on a field of alfalfa which will be used for hay. 523.4 A lot of water, which I believe is Nesbitt Lake, to the right and marsh lands at the side of it. This is another fertile valley, lots of farming and farm houses. 528.6 Cultivation of hay in the valley below me to the right. The rolling hills of the valley have low, but not very thick, scrub on them and I don’t think there’s anything on the mountain slopes. 530.3 Irrigation sprinklers on flat green area to the right below the road. 532.3 A crest - 4,016 feet, The road has left the valley and is winding through the hills now. 534.1 Another crest - 4,078 feet. 534.8 Over the range and out in another valley. 540.2 Sign at the side of the road: White River Narrows Archeological District. The White River Narrows Archeological District, approximately 90 miles south of Ely, Nevada, was listed in the National Register of Historic Places in 1976. The area is especially scenic because of its rhyolite cliffs on which much of the Archaeological District’s rock art is situated. One of the more well-known rock panels found at the White River Narrows is the subject of multiple interpretations. The panel itself is very large and follows the natural contours of the cliff face for perhaps as much as 16 feet. (5 meter) or more. The motifs include large linear features, depictions of large mammals (common for the eastern part of the state), and a number of motifs that might be representations of human footprints, as well as large numbers of non-representational motifs. 542.1 Erosion taking place in the hillsides on the left of the valley. There is very little traffic on this road, a few trucks which are probably taking a short cut but the road surface is very good, very smooth and I don’t mind being out here by myself. 544.8 The road is climbing out of the valley again and going up into the hills or mountains and entering a canyon. 551.6 A small badland area developing as the hillside erodes. 553.7 I just came over a crest, El. 4,705 feet. 565.2 This is a lovely broad valley, but it doesn’t look as if anything is being done with it at this point. Maybe ahead there’s some hay being grown - just an area a bit greener, a wide flat area. Most of the cars traveling south are from Idaho! 567.4 Passing a dirt road which is the turnoff for Bristol Wells. 567.8 I’ve been watching the gradual rise in elevation in a fairly short distance and now its 5,371'. You can see layer upon layer of mountains no matter which way you look and, as it said, Nevada is the most mountainous state of all the states. 580.3 5:28 Ely 74 miles, Lund 39 miles ... El. 5,690 feet. I think it is US-93 which is marked on the map as a scenic road, but this route is pretty scenic as was the other route I took further west. 582.5 The green countryside, the blue sky, the white fluffy clouds, the sun shining, the shadows of the clouds on the ground and the broad valley into which I’m just coming now ... What can I say? It is just absolutely gorgeous. 582.7 Entering White River Valley, and I can see the river off to my left. This is just a gorgeous drive. 588.9 Turnoff for Kirch Wildlife Area. 591.4 Sprinklers working in green fields. 591.7 Passing a rest area. 596.1 5:41 Ely is now 59 miles. I have had one vehicle catch up to and pass me. Otherwise I have not seen any behind me or in front of me going north. There have been a number of trucks, cars and motor homes going south. 600.0 5:44 600 miles and 11 hours 4 minutes since I left home. The sun is currently hiding behind a fairly big cloud but ahead there is a lot of blue sky so I should be out in sunshine again before too long. The vehicle that passed me did so while I was taking pictures in the canyon and I can still see it ahead of me so we are traveling at about the same speed. This is certainly a huge valley and I assume it’s still the White River Valley. There is still a lot of rock exposed on the mountain sides, which are totally different from the ones further south because they do have trees and growth on them. 610.1 White Pine county line. 614.0 Sprinklers working in a field, also some hay stacks, but no sign of cattle anywhere. 619.5 55 mph, then 45 mph as I come into another part of the valley, a wide green valley. I see a little town ahead now and a sign: tractors on the road for the next 8 miles. 621.8 Just increasing to 35 mph now. Sign: Deer the next 6 miles. 622.3 6:05 Junction with US-6 11 miles, Ely 35 miles. 623.6 Crossing another cattle guard . Lots of sprinkler systems throughout the valley. 629.8 My elevation is 5,761 feet. 630.9 Just passed a sign in the opposite direction for the White River Valley, so it was the White River Valley all the way through here. Stop sign: junction with US-6 west to Tonopah and east to Ely. NV-318 ends here. 633.2 6:14 Junction with US-6 and now Ely is 23 miles. 640.0 El. 6,171 feet and at that point the road just started to descend again. I can see the huge slag heaps from mining operations ahead and to the left. It’s like a staircase or terraces of walled rocks and then as they go over the hills and down in the valley and up over the next hill it gives a kind of scallop shape. There’s lots of juniper on both sides of the road since coming onto US-6. The road markers, both side of the road, have an additional, maybe three feet, of orange pipe or sticks on top of them, so I’m surmising they probably get a lot of snow through here. Sign for animals for the next 11 miles - I think the picture on the sign looks like an elk. 645.5 I am still climbing - the elevation now is 6,503 feet. I think that I have to cross this mountain range before getting into Ely, and I believe there is a mountain pass. I’m not positive but I think I am seeing some pinion pine as well as the juniper. 647.8 Passing a chain up area. Sign: Lion Springs Wash Upper Terrace. I haven’t been able to find anything on The Web as to what this means. 648.9 Signs: Winding road for the next 6 miles - also watch out for rock falling. There are lots of 4 inch rocks and rubble by the shoulder at the base of the cliff. 649.8 El. 6,900 feet - Humboldt National Forest ... over 7,000 feet now. 651.1 6:29 Murry Summit, El. 7,316 feet (7,231 feet by the GPS). I have caught up to a tanker truck pulling a tanker trailer as well, and since this is going downhill he has to really mind his speed . After coming over the summit the road winds through the mountains. Sign: Humboldt National Forest, Land of many uses. Winding through the hills, though actually it becomes more like a canyon that the road is winding through, with high rocky cliffs or steep mountain slopes. 655.8 Entering Ely, El. 6,435 feet “Welcome to Ely” I think I missed the turn for the city so hopefully there will be another one along here somewhere. Now I am driving through Ely looking for a motel ... and I’ll be out of town soon, so I’ll probably turn around soon and go back. I stopped at a gas station to ask directions - I was told there was no Best Western in town. Actually I found a Best Western in the Downtown area, but it had no vacancies. Then I stopped at the Jailhouse Hotel/Motel/Casino, but they had no downstairs non smoking rooms. Having driven around a bit I finally finished up at the Rustic Inn, which turned out to be very nice and had reasonable rates as well. 662.9 7:05 Rustic Inn, Ely, NV - Room 4 ... comfortable, one queen bed and the proprietor let me have it for $50.00 instead of $55.00 since I was on my own - end of the day. The proprietor was particularly helpful, too, in that she had her friends stop to get milk for me and wouldn’t take any money. I needed the milk next morning for my cereal and coffee, but didn’t want to look for a store! I wonder what the story is behind a sign along the main street here in Ely - Select anyone but Harry Reid (Nevada Senator and Senate Majority Leader). 664.6 6:52 - 6:57 Stopped at the Prospector Hotel and Casino to look at the animal statues lining the street and now I think I am on my way. US-93 is going north through another beautiful valley here in Nevada and I’m just amazed at how green everything is. Being accustomed to the desert dryness in Arizona a little bit of green just looks amazing. So far there appears to be numerous homes and small farms or ranches along the way. 675.2 7:09 Entering McGill, El.6,193 feet. Blue flax flowers blooming by the roadside right here in town. 675.6 The houses along the street all have cyclone fences and very narrow front yards. It looks as if they were houses right on the street originally, and now they have two or three feet between the verandas and the fence; some, without a fence, are right up to the sidewalk. A nice little town with tidy houses and lots of trees. 677.0 The speed now is 70 mph - the first time since leaving Ely. I’m still looking for signs that tell me how far it is to anywhere. 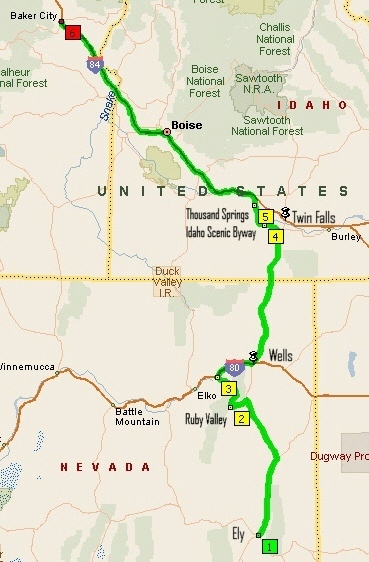 678.5 Wells is 124 miles, Twin Falls 239 miles. 680.0 White poppies, or desert evening primrose are blooming. 682.0 There looks to be a lot of smoke or cloud a long way ahead, or maybe it’s just fog, but it’s strictly a blue sky and the sun’s shining, so I’m not sure what I’m seeing. 685.8 Wendover 99 miles, Salt Lake 220 miles. Those mileages would apply if you took alternate US-93, which branches off up here somewhere. I don’t think it’s smoke, but rather just haze or moisture in the air as the sun rises. Mind you the sun is quite high in the sky now, but I guess that as the air warms up any dew there might have been is evaporating into the air. A beautiful drive through the valley. Very little traffic and this morning the mountains to my left are beautiful in the morning sunlight. Last night it was the mountains to the east that looked so lovely in the late afternoon sunlight. The road is slightly raised above the base of the valley closer to the eastern range. 694.7 There are irrigation sprinklers in the valley to the left, also hay stacks. It just amazes me that there isn’t any sign of more cattle. At the beginning of the road there was a marker with a ferocious looking bull on it for open range. I saw quite a number of those signs yesterday too, but no sign of animals. Another interesting thing as I travel north through Nevada is the predominance of Idaho cars going south. As I said there’s not that much traffic, but what there is seems to be a lot of trucks or Idaho cars. 703.3 Salt Lake 203 miles, Twin Falls 215 miles and Wells 100 miles. Also I am pulling up here for a rest area and an Historical Marker - Schellbourne. 703.6 7:35 - 7:39 Rest Area. I stopped here on a previous trip - May 26, 2008, when LP and I were returning home from Vancouver. National Pony Express Centennial Association Trail Marker. This morning the sun is shining behind the Schellbourne Historical Marker, but I will walk across the road for a closer look at the Schellbourne Bar and Café and the sign about the Pony Express trail 1860 to 1861. Back on the road. There were deer signs somewhere earlier but now the animals depicted on the sign look like pronghorns. That’s something I know you see in Wyoming, but I didn’t know they might be seen here too. 722.4 This is an area where the valley extends for miles to the left and it’s as if there’s a slight break in the mountain range, then another range way in the distance. It must be a higher range as it appears to have some snow on it, but it’s so far away and the valley extends well out towards it. Approaching the junction at Lages Station where alternate US-93 goes northeast to Wendover. 724.5 7:57 Alternate US-93 goes straight ahead and I’m turning left for US-93 north. Currie is 15 miles, Wells 75 miles and Twin Falls 189 miles - the next gas is 78 miles. Prior to turning off I had been traveling in a north easternly direction but now I’m going north, and the range that had the snow on it is to my left and forward at the moment. 725.7 I’m passing fields where the hay has been cut and baled - it’s just littered with bales of hay and there are lots of irrigation sprinklers on other fields. I’ll should be in Wells just after nine o’clock and Twin Falls by about eleven. 737.3 The road is winding through rolling country, which is a bit hillier. The valley is not as flat and not as wide and I have mountain ranges all around me again, all very green and lush looking. Lush is hardly the word - it’s not lush grass ... it’s small shrubs ... not even at lot of sagebrush ... a bit but not that much. 738.5 The elevation is over 6,000 feet. 739.5 Passing a turnoff for Cherry Creek. There was another turnoff for Cherry Creek shortly after the Schellbourne Rest Area and it was there that another car joined the highway and passed me - a woman from Wisconsin traveling by herself! 740.7 The heart of a very small settlement, no more than half a dozen houses. 741.1 Wells 62 miles, Jackpot 129 miles, Twin Falls 178 miles and now the distant range with a little bit of snow on it is directly in front of me in the distance. 741.5 As I came around a corner and could see that, there were some black cattle in a pen or a small holding lot. 744.9 Whatever the low shrubs are, they’re all in flower, yellow flowers. 751.4 Some junipers both sides of the road, fairly close to the road and now the road goes straight. There is snow on the mountains to the left, and to the right well ahead, and as I come over a crest, that particular range is extending south and is actually to be seen out to my left now. What a glorious morning and magnificent scenery. 761.3 Wells 42 miles, Jackpot 108 miles, Twin Falls 155 miles. However since I’m in such good shape I’ve decided I’ll do a little detour which will probably take me to the foot of the mountain range with the snow on it. 765.4 The mountains with the snow on them appeared to be to the right but are actually directly in front of me now. They are part of the same range that was to the left except there’s a low section joining the two parts. 771.0 The road went through some shallow cuttings where the soil or ground is fairly white, almost as if it were sandy or limestone. 773.0 US-93 is going straight ahead towards the mountain range and then it turns to the right to follow along the foot of the range. When it reaches the end of this section I think I will be turning onto NV-229 to detour to Ruby Valley. Ruby Lake National Wildlife refuge is also out in this direction. 775.4 8:43 Turning off US-93 right now. 780.6 Stopped for a picture, at the side of the road before dipping down into the valley. 781.6 Passing a turnoff for a gravel road to north Ruby Valley. 783.0 Passing roles of hay and a green circular field with the sprinkler system in it. 784.7 More hay stacks, both sides of the road, also rolled hay and more green fields and irrigation systems. 787.7 8:58 Can see lots of cattle to the right of the road. Ruby Lake 35 miles, Elko 57 miles. 790.7 A lot of vultures sitting on fence posts ... I tried to get some pictures. 791.1 9:07 Baled hay in front of the mountains ... a hawk sitting on top of a telephone pole. I’m actually seeing quite a lot of cattle now on this route as I head north again. It is interesting because there’s lots of sagebrush and yet in between there are these round fields where hay is being grown and the sprinklers are working. 798.1 9:16 There’s a lot of cattle but they’re hidden in the sagebrush. It’s a great ranching valley with lots of areas where the farmers can grow their hay and then graze their cattle. The highway here is adopted by the Ruby Valley Friendship Club. I wonder if that’s the same type of friendship club to which Jo and Sam belong. 801.2 The road is winding and twisting through foothills now. 802.9 More green fields to the right ‘tho not as big because the valley is not as wide here, but there are lots of hay rolls. 804.6 Passing a turnoff to the right for North Ruby Valley. The Secret Pass Route in the Ruby Mountainsis one of the alternate roads on the Emigrant Trail. Peter Skene Ogden came this way in 1828. The Bidwell-Bartleson emigrant party of 1841-1842 most likely used Secret Pass. If the Donner party of 1846 had crossed Secret Pass, instead of missing it, they might have gone to California in time to outrace the devastating winter in the Sierra Nevada. El. 6,457 feet. Little ground squirrels scampering across the road, or maybe prairie dogs ... lots of horses ... more hay still winding through foothills. 808.9 Aspens on the hillside to the left. The road has climbed up the hills and I’m looking down into a very rocky, steep ravine. As the road winds around I can see another valley in the distance ... wild sunflowers at the side of the road. 811.5 Water in the stream in the bottom of the valley. This is a narrow valley through which the road going. 815.2 Turnoff for CR- 702 - Lamoille 18 miles. 817.3 Turnoff to the right for Starr Valley (near Deeth). The road that I’m on will take me to I-80 near Halleck. From there I will go east to Wells before heading north. As an alternative I could go west to Elko then north to Mountain Home but I think I’ll stick to going back to US-93. I would like to do the Elko to Mountain Home route again some time, but not today. This detour through Ruby Valley was well worthwhile, and I’d do it again. 821.5 I can see semis traveling along I-80. 822.7 Broad valley to my left ... lots of rolled hay ... some cattle ... traffic - lots of it on I-80, I see it before I even get there. 825.1 Crossing another creek or a river ... actually I think this is the Humboldt River ... I noticed an egret, also a red winged black bird. 825.4 9:45 Stopped at a railway crossing - the lights started flashing, the barriers went down and here comes a train, fortunately not a very long one, but it does have an engine at the front and one at the back. 9:47 Up go the barriers and I’m on my way again. 826.4 Leaving NV-229 for the ramp onto I-80 east. 826.6 9:51 Junction with I-80. 834.2 9:57 Wells is 23 miles, Wendover 82 miles, Salt Lake 210 miles. Deeth and Starr Valley next exit. I knew I’d seen something about Starr Valley some other place sometime. 838.6 Passing exit 333 for Deeth and Starr Valley. 848.7 Passing Exit-343 for Welcome and Starr Valley. Welcome is to the north, Starr Valley to the south. Goats Beard has flowered and gone to seed at the side of the road ... great big balls of seeds. 854.0 Wells is the next two exit ... I’ll leave the interstate at Exit-351 for West Wells. 856.5 10:14 Off the interstate. 857.7 10:17 - 10:23 Wells Information Center. The info center wasn’t open but I talked to some people who were also stopped and looking for information. I was able to tell them what road to go on for what they wanted. 858.8 10:37 At the stop sign where I’ll be turning north on US-93. Jackpot is 68 miles, Twin Falls 116 miles. I did 195.9 miles from Ely to Wells via the Ruby Valley detour. Had I stayed on US-93 it would only have been 138.4 miles, a difference of 57.5 miles! 866.9 Deer migration the next 3 miles. 869.2 Crest of the summit (no name) - 6,102 feet. There are signs which are turned away from the road requiring chains or snow tires for coming across here in winter. The snow fences all along the left of the road indicate that prevailing winds coming from the west. 878.6 10:53 H D Summit, elevation 6,280 feet. Except for I-80, I think this is the busiest road I’ve seen since leaving Las Vegas. A big semi trailer in front of me is from Alaska, and he has just pulled off to the side of the road in a parking bay. With the number of Idaho cars going south, I’m wondering if there is anybody left in Idaho!! 896.3 Road work next 20 miles. However, there’s no sign of any work being done as yet. 900.3 A ranch house and some land which has been cultivated for hay ... up to now there hasn’t been anything other than the sagebrush both sides of the road. 901.8 Some hills ahead, that are more or less flat on top and green and then drop away, medium slopes, maybe some rock just below the grass before the slope starts. 905.3 Another ranch, on the left. 906.1 Gravel pits and a lot of road work equipment on the right. 907.6 The hills on the left have become very, very rocky, lots of individual rocks all piled on top of each other and scattered down the hillsides, and just ahead, as the road rises slightly ... extremely rocky. 910.0 Crossing Salmon Falls Creek, and unlike the creeks and rivers in Arizona, there is water in it..
911.2 Entering Contact, El. 5,377 feet. I am still going through the rocky area. Jackpot is 15 miles, Twin Falls 62 miles. 917.0 The road is about 15 feet (just guessing) above the surrounding land, crossing a small dent in the hills, but I don’t know why it is build up to that extent . It’s just hard to imaging that they put so much fill into crossing a relatively flat area. 919.1 End road work. I don’t know what they’re going to do - the road is in excellent condition and I can’t see any reason to do anything and certainly nothing has been started ... all that was evident was the gravel pit and all the trucks. 920.3 Soil very white in a cutting and then ahead after going down hill and across a flat area, it looks as if the soil is a reddish color. 923.4 Passing at the base of the hill with the red soil or red rock which I mentioned back where the white cutting was. 924.0 Passing a Rest Area and just after that Salmon Falls Creek. 926.6 11:33 Entering Mountain Time Zone, which means it’s 12:33. Jackpot, El. 5,265 feet. 927.5 11:36 - 11:52 Lunch stop ... the time is really 12:36 to 12:52 (Mountain Time ... knowing that I would be driving back into Pacific Time later today I am not changing the time through Idaho). 928.2 11:54 Entering Idaho. Twin Falls 42 miles, Hollister 26 miles. 929.9 Elevation 5,636 feet. There was just a marker for the elevation but no name for the summit. I did some research last time I came this way but couldn’t find any name for this particular summit. Constructed in 1910 about eight miles west of here, the Salmon Dam was a spectacular early irrigation structure. Two hundred twenty feet high, it blocks a narrow lava gorge of Salmon Falls Creek. Intended to create a large reservoir to irrigate desert lands north of here, it was only a partial success. Porous lava canyon walls let water escape around it and lack of rainfall in Nevada's desert above here provided less than enough moisture for this reservoir. It did not fill up until 1984. 946.1 Hollister is 9 miles. 949.8 Milkweed in flower along the highway. Starting to see more population and a lot more agriculture, crops, hay, cattle. This is much better looking countryside as far as farming. 953.9 Crossing a canal full of water - don’t know if the water is coming from the Snake River or the Salmon Falls reservoir. A weigh station and it’s open! 965.8 Looks like a big dairy farm across the fields to the left. 966.7 Crossing another canal full of water. 968.8 Crossing another full canal of water. US-93 turned off to go to Twin Falls. 971.0 12:34 I’m turning left on US-30 west, Thousand Springs Scenic Byway. Boise 125 miles. 972.6 Entering Filer, pop. 1,620. 973.9 Passing a very nice looking Rest Area. 980.0 Lovely houses with gardens and lawns both sides of the road. 980.8 12:45 Entering Buhl, pop. 3,985. Couple of nice looking motels here ... 97° ... lots of corn fields, lots of ripen crops, I don’t know what it is, not corn, not wheat or rye, also vegetables. 990.7 Starting the descent to the Snake River - 6% grade. 992.0 Can now see some of the black lava cliffs now. 994.2 Passing an outcrop of lava right at the side of the road and there are more areas of lava sticking out of the hills as I travel. 995.5 Lava pits to the left and I think I caught a glimpse of the Snake River on my right. Ahead I can see the waterfalls coming out of the cliffs above the river. The waterfalls are what give the Scenic Byway its name, Thousand Springs. 996.3 A big bull by the fence to my right and then there’s more further along. Thousand Springs and Salmon Falls Historical Markers, LP and I came by here May 25, 2008 on our way back from Vancouver. 998.2 Starting to cross the Snake River, which here looks very full. 998.5 End of the bridge. 1,001.4 1:07 I missed saying I was 1,000 miles from home because there was a truck coming out onto the highway. 1,006.6 Passing Malad River, and after that the road climbs up hill. 1,010.5 I can see the traffic on I-84. Entering Bliss, pop.275. I will stop for gas before getting on the interstate, so I won’t have to worry about that for the rest of the day. 1,012.1 Crossing a painted cattle grid. 1,012.4 1:26 Junction with I-84 at exit 141. I think I’ll forego at lot of commentary on this route as I’ve done it so often. Unless I see something really unusual there’s not point in commenting again. 1,024.8 Crossing the Snake River. 1,028.8 Lovely view of green fields on both sides of the Snake River out to the right. 1,031.2 Crossing the river again, also the railway tracks which were running along at the side of the river. 1,083.3 A thermometer at a gas station showing it to be 103°. Gas station at Exit-71 which is for Old Highway 30. 1,096.3 2:31 Boise City Limit, pop. 285,787. Traffic very slow going through Boise because of road work - a lot of construction going on, road widening, new overpasses, new ramps. 1,103.7 End of road work and resume 65 mph speed. 1,108.8 More road work and back to 55 mph. 1.110.1 2:45 Heavy traffic and I’m stopped momentarily, and again, and again! Some cities seem to have on-going road work year after year. It seems that this work around Boise has been going on forever, and I think Little Rock is the same category. Just different places seem to go forever. 1,131.3 3:06 Baker City 100 miles. 1,155.6 Starting to cross the Snake River. 1.155.8 The other end of the bridge and, “”Welcome to Oregon” and now the speed limit is 65 mph and will be the maximum until I get to Washington. 1,178.1 Driving alongside the Snake River. So far today there is no sign of any pelicans. 1,179.0 Pendleton 145 miles. There is a small boat on the river. 1,184.2 A lot of horses to my right with baby foals which look as if they have just been born. 1,185.4 Intermittent road work the next 30 miles ... long row of snow fences to the left of the road ... a rather long stretch of the interstate going into Baker City being rebuilt. I didn’t note when it started but it’s been two-way traffic on the east bound lanes for a number of miles. 1,217.4 End of road work ... this is near Exit-317 for Pleasant Valley. 1,229.1 4:32 Entering Baker City. Going to leave the interstate at Exit-304. 1,231.0 4:33 Leaving the interstate at Exit-304. 1,231.6 4:35 Arrive Best Western Sunridge Inn, Baker City, Oregon. 1,231.8 Parked for the night, Room 259. 1,231.8 7:00 Leave the Best Western Sunridge Inn and driving to Yakima, WA today. Leaving the gas station the GPS indicated that it was only 238 miles to Yakima, so I have decided to make a detour and do some exploring!! I have lots of time before I need to be in Yakima, so I don’t have to stick to the interstate. 1,232.9 Crossing the Powder River, which is flowing quite quickly. There must be some function on in town because there are a lot of tents in the park. After leaving the gas station I drove through the historic area of Baker City ... some beautiful buildings here. I came to a dead end because the road was closed for road work. I spoke to a man driving a truck and I’m now following him through streets to get to the detour. Well that was a roundabout way, but now I’m leaving town after that long detour. 1,235.3 Leaving from the truck that I was following. Sumpter is 27 miles, Hereford 34 miles, and Unity 46 miles. I’m not sure if I’m going to all these places. I have taken some of this route previously and enjoyed it but I’m going to take some new roads as well. The highway is called Journey Through Time Scenic Byway. There’s water and reeds in the ditch at the side of the road ... something foreign to people from Arizona. 1,238.0 Fields both sides of the road with hay that has already been cut and is ready for baling. In some areas it has already been baled, big rolls. 1,239.5 The GPS actually has me turning around and is indicating that it is 244 miles and 3 hours 54 minutes to my destination. However, the GPS is going to spend a lot of time recalculating!! This route is also called the Elk Horn Scenic Drive. 1.241.6 Leaving the fields of hay and entering a canyon. The canyon opens into a narrow valley and someone is living here and growing hay. 1,243.5 Road work, where they’re cutting more of the hill away and making the corner less severe, also building a bridge over the river. Bridgeport, Hereford and Unity the next right. 1,244.0 John Day is 70 miles. A sign which has both Elk Horn Scenic Drive and Journey Through Time Scenic Byway on it. 1,244.8 Crossing Powder River. The road is winding through mountain valleys following the route of the river which is brim full and flowing very fast. 1,248.0 Passing log buildings ... look like old ones. 1,248.7 Entering the Wallowa-Whitman National Forest and the hillsides are now covered in pine trees. The road continues to wind through the mountains and the flowing river is still to the left of the road. 1,249.7 The road and the river going through steep rock cliffs. 1,251.0 The road is leaving the river and climbing up hill ... the GPS is showing a large lake hidden back behind the trees somewhere to the left. It could be a dam on the river. 1,251.7 Yes, it is a dam, I can see the dam wall right below me at this point and this is also the beginning of the lake. Nowhere to stop for a picture. 1,256.0 I still have the lake out to my left. 1,256.6 Passing the end of the lake. Sumpter Valley Historic Railroad Depot is to my left. 1,258.8 It’s an historic steam railroad and there’s all sorts of tailings at the side of the road near the railway. This would be from the gold dredge here in Sumpter, and the valley to my left is just covered in tailings. 1,259.8 On a curve of a road where I can’t stop I can see a bird’s nest on top of one of the telephone poles, some kind of a hawk and I can see the heads of the babies. Last time I drove through here I would not have been aware of all the tailings but I recognize them after being in Dawson City in the Yukon. Rather than turning me back to Baker City the GPS is now taking me on a different route, but I’m not going to follow that either. Rather I am staying on OR-7 and not going into Sumpter this time. 1,261.2 Just passed the turnoff for Sumpter. 1,261.4 John Day 53 miles and 25 to the junction with US-26. 1.261.8 Passing the Powder River. 1,262.0 Back into pine forest. 1,262.3 Crossing a snowmobile route through the forest and climbing up the hill from the valley of the Powder River. 1,265.0 The crest of the hill and I can’t get the elevation because GPS is recalculating!! 1,265.8 Going down hill and as I go around a big bend I have distant views for about 200° looking across at the mountains or all the mountains slopes. 1,269.6 8:03 - 8:04 Because the GPS is frustrating me I have pulled up to turn off the motor and thus get rid of the directions for my destination! This is 17 miles before the junction with US-26. The elevation was 4,252 feet so I was up over 5,000 feet earlier. It is beautiful winding through the forest, uphill and downhill and opening out into grassy meadows, the scenery changing constantly. The only wildlife I have seen are chipmunks by the road or scampering across the road. 1,277.1 A big bunch of daises in flower at the side of the road. 1,279.4 8:15 Tipton Summit, El. 5,124 feet. Descending from the summit, the forest is really thick. 1,282.9 8:24 Leaving after pulling off the road for a pit stop in the forest. I also checked out the map for the road that I need to take. I will be a the junction with US-26 in 4 miles. 1,283.7 A deer and her baby, so now I’ve seen some wild life. She was just at the side of the road on the right hand side, but I had another car coming behind me and with double lines there was nowhere to stop. 1,285.3 Crossing a meadow or pasture land with lots of cattle grazing in it. Journey Through Time goes to the right at the junction with US-26. 1,287.2 8:29 Junction with US-26 John Day is now 28 miles ... dense forest. 1,291.6 Work being done on a bridge and a single lane across the bridge, a flag person with a stop and slow sign. 1.293.2 Turnoff for a national forest campground, the Dixie Campground. 1,294.1 8:38 - 8:41 Stopped for historical site Stump Dodger trail. 1,294.8 Leaving Malheur National forest. 1,294.9 Log house on the left with a stone chimney. 1,295.1 I am looking ahead over a broad valley with a mountain on the other side that has a patch of snow on it ... from here the road is going downhill towards the valley. 1.297.6 Turning off for a view point. 1,300.5 Passing a chain removal area. There is a lot of houses in the valley, a green valley, with a lot of farming being done, probably growing hay. 1,302.1 Farm houses on either side of the road and then houses, as I approach a town with fields of hay to the left. 1,302.4 8:58 Entering Prairie City. 1,302.8 A house with a lot of sunflowers and lupin in their front yard. A lovely little town, looks as if people take great pride in their town. 1,303.4 John Day 13 miles ... a sawmill to the left ... slow vehicles required to use turnouts. 1,305.5 A red tailed hawk in fight and then landing on a telephone pole. The mountain range on the other side of the valley to my left still has some patches of snow on it. Also at various spots along the route lava rock has been exposed ... beautiful log house to the right. 1,303.7 Crossing the John Day River. The log house has some beautiful hanging baskets along the front veranda ... lots of rolled hay through the valley ... there are also some patches of marsh land with reeds growing in it. 1,309.7 A cyclist, with saddle bags, going in the opposite direction. The John Day River is in the valley to my right ... I can see it on the GPS and further ahead the road actually comes quite close to the river, I think. There are high volcanic rock walls at the top of the cliffs that come down to the river ... these look similar to those you see around Yakima in Washington. 1,312.5 The baled hay here is in not rolled but is in oblong blocks, then in the next field the hay has been cut but not baled. Interesting! I’m one of three vehicles traveling this way, one ahead, one behind me and apparently we are all traveling at exactly the same speed! 1,313.5 9:16 Elevation 3,083 feet - on a sign at the side of the road. Now the road is immediately by the river, but I can’t see it as there are a lot of bushes between me and the river. 1,314.2 Ah! There it is, the John Day River ... irrigation sprinklers on a field of alfalfa. 1,316.3 Junction with US-395, that is where US-395 from the south joins US-26. 1,317.8 Close to the river again, momentarily. 1,318.2 Leaving John Day. I’m saying I am leaving because the speed has accelerated to 55 mph, but there are still quite a number of houses outside of the town ... horses at the side of the road ... hay country and some flat area of the valley to the right. 1,319.1 Just passed a veterinary, which is called the John Day River Veterinary. Bridge work ahead - a one lane bridge with a temporary traffic light in operation to guide the traffic. 1,322.9 9:29 - 9:30 Stopped waiting for the light to turn green. 1,322.9 Crossing the John Day River. 1,324.4 9:32 Entering Mount Vernon. 1,324.7 US-395 north to Pendelton leaves US-26 at this point. So now I am on US-26 only. 1.325.0 83 miles to Dayville, 154 miles to Arlington ... I am still on the Journey Through Time Scenic Byway. 1,326.5 Crossing the John Day River again. The country through which I am traveling now has the John Day river valley to my right, lots of hay, small patches of marshland with bare grassy hills, just an odd tree here and there as a back drop - the slope to left is covered in sagebrush. This is where it opens out a bit , the mountains are higher on the left and some of them are forested. Here is some places, the valley opens up on the left as well but the hills or mountains are certainly much higher to the south of the road than those to the north. Lovely fertile valley with numerous ranches. 1,333.3 Out crop of volcanic rock at the side of the road - sort of like a fin except it wasn’t continuous but broken like a chain of chimneys. 1,335.7 Crossing the John Day River again. 1,336.6 Passing a building on the right that looks as if it was at one time a one-room school. 1,341.8 A sign for elk ... also the valley is widening out again with some alfalfa fields and the road will be crossing the river again, the road and the river winding back and forth all the time. 1,344.8 Crossing the river ... not a huge river but it is flowing at a good speed. It is ranching country but there is no sign of any cattle - maybe it’s open range back in the mountains. Another geological marker ahead - let me see if I can find this one, because I missed the others. 1,346.5 Pulled off for the marker but it has disappeared. There’s nothing there - maybe this is what has happened to the others! 1,347.0 Now the hills to the right have the high rock cliffs at the top. 1,347.6 Entering Dayville. A sign at the side of the road, depicting old men standing in a row, WElCOME TO DayVILLE - OUR FOSSILS ARE FRIENDLY. 1,348.0 Crossing Southern Fork of the John Day River. 1,348.9 Mitchell 39 miles, Arlington 127 miles - I’m not sure if I go to either place. 1,350.2 Corner fence posts which are made of wire netting circles filled with rocks. 1,351.5 Well, what do you know! Some cattle, a few grazing in a field! A large green area is showing up on the GPS and I don’t know what it is, but I’m sure there’ll be a sign for it. John Day Fossil Beds National Monument Overlook. Save for the use of his name, John Day himself was of no importance to the area. In fact, John Day Fossil Beds National Monument was named after the river, Still, how did the river get named? John Day was born in Culpeper County, Virginia, about 1770. In 1810 he joined an expedition to establish a fur trading post at the mouth of the Columbia River. The party became divided and separated. Experiencing hardships, John Day’s group dwindles to two people. He and Ramsey Crooks eventually reached the mouth of the Mah-hah River along the Columbia. There a band of American Indians took everything they had, including their clothes. They were rescued and reached Astoria (Oregon) in 1812, where he settled nearby. Due to this incident people traveling along the Columbia River would point out the mouth of the river where John Day was robbed. By the 1830's the Mah-hah River was referred to and renamed the John Day River. If you name the mouth of a river you name every stretch of it upstream. As far as we know, John Day never came within 100 miles of this site. Leaving the Overlook I could turn to the right, taking me to another area, but the route that I’ve chosen, OR-19, goes through the area where there are a lot of fossil beds, so I’m just going to return to the highway at this point. 1,354.4 10:21 Back on US-26. 1,355.1 10:22 -10:24 Stopped for a Geological Marker - Picture Gorge. Leaving from the Marker the road goes through Picture Gorge. 1,355.6 10:28 Entering John Day Fossil Beds National Monument Sheep Rock Unit ... Winding road for 2 miles, no shoulder. Thomas Condon Visitor Center is along route OR-19. 1,358.9 Turning into the Visitor Center, The Thomas Condon Paleontology Center. Oh boy! What a detour! This is a fabulous place and I could spend ages here, but it’s still a long way to Yakima. I’m going to have to curtail my planned route. 1,359.2 10:52 Leaving the Visitor Center where I looked for a payphone so I could call Elsa, but the area was too remote! 1,361.6 10:57 Leaving after having stopped for a temporary red light foe another one-lane bridge ... this light was strung across the road. An amazing drive - there’s no other word for it. 1.363.6 I know I’m out of the National Monument now (can tell by the GPS) but I didn’t notice the exact moment when I left it. 1,365.3 Cathedral Rock ... this is amazing country. 1,369.0 Greenish colored formations or erosion. 1,370.6 there are cattle here at the moment and sprinklers irrigating hay fields. Wherever there is a bit of flat fertile land it is put to use. 1,371.5 I just crossed Bone creek. I wonder if it’s name has anything to do with fossil bones. The river that’s following the valley is called Fossil Creek. 1,375.9 Crossing the North Fork of the John Day River which is a lot bigger river here ... in the valley there are orchards, lots of fruit trees, a corn field. 1,376.0 11:17 Entering Kimberly. It’s now 13 miles to Spray as I continue on OR-19 and Fossil is 46 miles. Now I believe the road is following the North Fork John Day River. 1,376.7 Entering Wheeler county. There are people in boats on the river to my left. 1,377.5 Rock cliffs to the right have wire netting on them to stop rocks falling on the road. 1,381.5 I can see some hexagonal columnar jointing in a cliff to my left. 1,382.5 Pulled into a scenic vista, surrounded by trees, so I can’t really see anything. However there is a picnic table under the trees, a very nice spot called Shady Grove but I think I’m just going to continue on and not stop here. 1382.6 11:26 Back on the road. 1,383.6 Another area of erosion, the light color in which fossils are being found. 1,386.4 Spray 3 miles, Fossil 35 miles. 1,390.9 Somebody sitting in a tube in the middle of the river fishing. 1,392.0 Picture of the rocky cliff or the stepped volcanic rock. More people on the river, three lots in floats. 1,392.6 Another sign for the Journey Through Time Scenic Byway, a very appropriate name for the area through which I’m traveling. 1,395.5 A rock wall coming right down to the road on my right and there are names for several creeks that have cut their way through the rock wall to flow down to the river which is on the left, The river is not very fast flowing, but it is obviously used by people for recreational purposes ... I just passed somebody else canoeing. 1,400.9 Passing River’s Edge Bed and Breakfast . I’m finding this to be a really fascinating drive with all the rock formations and the geological history that goes with this area. 1,403.0 The road turned north, leaving the river and going up through a different valley with high rock cliff on both sides. 1,407.2 Into a thin pine forest ... seems to be a lot of dead trees and I think, judging by the look of it, there’s been a bush fire through here - a lot of the trees have been decimated by fire. 1,408.0 Large formation protruding out of the hillside. 1,408.3 Crossing a painted cattle grid. 1,409.6 This part of the forest doesn’t seem to have had the fire through it. Passing an interpretive site, Julia Henderson Pioneer Park. 1,410.0 Another painted cattle grid and the road feels to be climbing at an elevation of 3,400 feet plus ... it sure is climbing, 3,740 feet at what appears to me to be the crest. 1,412.7 12:01 3,757 feet ... Butte Creek Pass elevation 3,848 feet. 1,415.1 A dead deer at the side of the road near Bear Hollow County Park. 1,415.5 Another painted cattle grid. Lots of insects in the air ... I think they are grasshoppers and I can hear them hitting the car. 1,417.0 They are making a mess of my windshield which is going to stop any photography!!! 1,420.6 Lots of horses and at that point I came out of the rocky mountain area into lower grass covered hills. However, ahead I can see another large high area with lava rock exposed. 1,421.6 Welcome to Fossil .. The sign has a picture of a mammoth on it. 1,421.7 Entering Fossil and whilst here I’m going to try to find a telephone so I can call Elsa to give her some idea of when I am likely to arrive. This is an amazing detour, but it is taking me longer than I expected. I want to come this way again some time and spend more time exploring the area! 1,422.1 Turned off the road to search for a telephone. 1,422.3 12:12 - 12:17 Local hardware, liquor, general store to make inquiries for a phone. 1,422.5 12:18 - 12:28 Public phone, which did not work ...I went into a building at the corner by the pay phone. There they said the phone had not worked for some time, but very kindly let me use their phone which was very helpful, so I was able to talk with Elsa and now she knows that I am running late! 1,422.7 Passing the Wheeler County Courthouse. I stopped to stopped to look at the woolly mammoth statue before leaving town. 1,423.3 12:30 According to the GPS I still have 154 miles to go and 3 hours. Whilst I was stopped I got my lunch out of the cooler so I’m going to be munching for a while. 1,427.1 Cummings Hill Summit, El. 3,310 feet and the view is of bare grassy hills, no rocks, but there is a windmill. 1,429.7 Entering Mayville - about half a dozen houses and some very old wooden buildings. 1,430.1 Around a corner and to my left a very broad expanse of rolling country with ripened crops, and the same ahead. 1,430.8 The road dropping down from the rolling plains into a valley. Interesting! Once you drop down from the high plains you start seeing exposed lava rock again. Rocks the next 4 miles and the crops are up on the prairie at the top of these cliffs. 1,434,4 Driving through this canyon ... it is hard to believe that there are crops on top of the hills. 1,436.4 Start of the bridge over Thirty Mile Creek which is fairly deep below me. 1,437.0 After Thirty Mile Creek, the road starts to climb again. As with many previous times I wonder how they decide or who decides on a route through such an area. 1,440.9 Just caught a little glimpse of a ripened crop on top of a hill as the road climbs up to the high plains. 1,442.1 A beautiful park with groomed grass, a fountain and pretty flower bed, some old brick buildings, also a stone building here in Condon. 1,442.5 Stop sign. 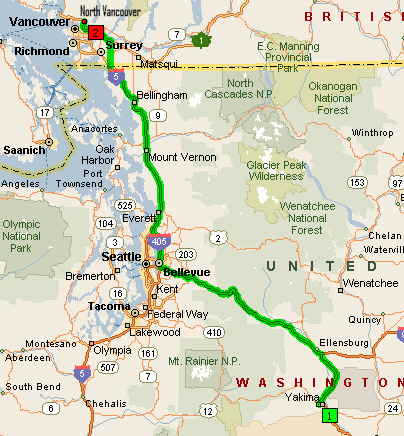 OR-19 continues north to Arlington and I turn onto OR-206 for Wasco, 40 miles. Ripened wheat crop to my right, plowed field on the left, then a ripened crop on the left. 1,444.6 Passing a wind farm on the left ... about 13 windmills and there’s a lot more windmills to the right in various sections. 1,445.7 Somebody is plowing their field and the dust is rising. Lots of windmills. 1,448.5 I just spotted a big mountain with snow on it ahead of me and this is perhaps Mount Hood. 1,450.0 It looks to be a big valley in the distance which is probably the Columbia River and now I see a second mountain which would be Mount Adams. 1,455.2 Now I can see 3 mountains so that’s going to be Hood, Adams and Rainier ... pretty exciting to see all 3 of them. 1,460.8 1:13 - 1:18 Pulling up for a Mountain Identifier. When leaving GPS showed an elevation of 2,562 feet and the road is on a downhill run as it heads towards the Columbia River. Ahead between here and Mount Adams there’s a lot more wind farms. In fact they seem to go along the ridge for a long way. I wonder what they call the valleys around here. Are they ravines? Are they gullies? They’re very deep, very rugged and then there’s the plains on top of the hills which are used for crops. 1,462.8 Over a rise Adams is directly in front of me, Rainier a little bit to the right and Hood to the left. It wasn’t clear enough to see Mount St. Helens and I couldn’t see Mount Jefferson. 1,466.6 7% grade and the hills seem to be a lot higher now because the road has dipped down so much. 1,468.7 Crossing the John Day River (165 miles since I first mentioned crossing the John Day River) and immediately the road starts to go up hill again. I don’t know if the road will climb to the top or not because eventually it has to come out at the Columbia River Valley. 1,470.0 The road is still climbing. 1,471.9 Columnar jointing in the cliffs on the right. Crossing road called Starvation Lane! 1,473.2 More windmills just ahead so I must be nearing the top of the assent. 1.474.0 Passing some of the windmills which are located in a field with a ripened crop. 1,474.4 Top of hill, El. 1,742 feet and Mount Adams is visible, much closer now and is to my right .. seems to be windmills whichever way I look ... entering another narrow gorge. 1,477.0 Hay Canyon - Stopped at the top of the hill amongst the crops and the windmills looking ahead to the snowy mountain, Mt. Adams, I believe. Some of the windmills I can see are on the other side of the Columbia gorge and now I can just see Mount Rainier showing up above the cliff and Hood is to my left. 1,483.0 An orchard to my left beyond the wheat field. 1,484.0 Stop sign and turning towards the junction with US-97. I don’t think I have actually joined it yet, but am following the signs through town to get to US-97. The Dalles is 29 miles, but I will be crossing the Columbia before I get there. 1484.9 1:50 Turning onto US-97, actually onto a ramp to go down to the highway, which is still part of Journey Through Time Oregon Scenic Byway. Biggs Junction is 9 miles and Mount Adams is directly in front of me. This certainly has been an amazing drive today. 1,490.0 The road is descending again through a deep ravine. 1,494.6 and now I’m in Washington. 1,495.2 I’m on the long hill going up on the other side of the Columbia, looking down on orchards and vineyards, beautiful green in the valley. I’ve done this road several times before so maybe I had better be silent for a bit. I can’t seem to stop talking! 1,495.7 Here’s a WElCOME TO WASHINGTON sign, The Evergreen State. Mount Adams is in full view and Mount Rainier just peaking over the top of the range. The old wooden hut in amongst the trees is still there looking out over Goldendale. 1,514.6 Mount Adams is certainly dominating the countryside today, so high above at the surrounding land ... 2,372 feet on the GPS ... no sign of anything ... I thought we were going to Satus Pass. The road descended and now is rising again. 1,521.2 Stopped, with a long string of traffic behind a very slow moving truck, actually there were two trucks, one has pulled off but the other one is continuing. 1,521.8 2:31 Satus Pass, El. 3,107 feet, (3,048 feet on the GPS) and at that same point entering Yakima Indian Nation ... the other truck just pulled over. 1,528.7 2:37 Toppenish 28 miles, Yakima 47 miles. It takes a long time to get out of the hills onto the fertile valley coming on US-97. 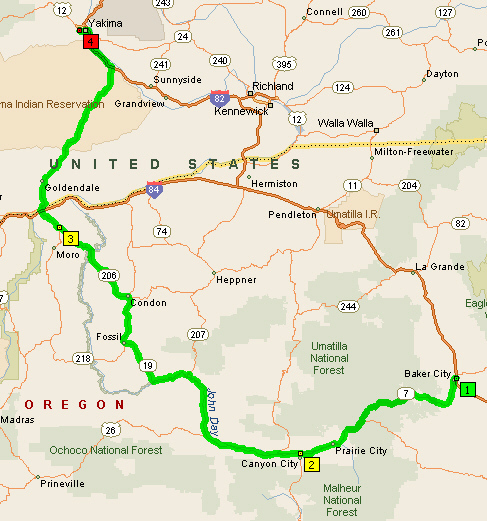 This route is not as attractive or as interesting drive as the interstate, that is I-82, which starts at I-84 in the Hermiston area just before leaving Oregon. So much for slow vehicle turn out! Somebody ahead in this long line of traffic refuses to do the speed limit, and in spite of signs to use the turnouts if more than five vehicles are being held up. Nobody is getting out of the way. Now at the top of a long hill, and coming around the corner at the top I got my first glimpse of all the green of the Yakima Valley and now I’m going down the hill. 1,553.8 Down in the valley, corn on both sides of the road. The green of the valley is creeping up the hillsides further than it did when we first came here. I guess our first trip was in 1993, and that’s 16 years ago! Hard to believe! 3:05 Through the traffic light. I’m on I-82 now going to Yakima and I’ll go to get off at US-12 where it leaves I-82 at Exit-31, the White Pass and Naches exit. 1,578.3 3:27 Exit-31. I didn’t follow the GPS like I did last time getting off at Yakima Avenue, but I came on to US-12 west and now I’m turning up 40th Avenue to Englewood and then east from there. Gas light has just come on as I arrived. 1,583.3 3:35 Arrive at Dave’s and Elsa’s in Yakima (My exploring detour entailed an extra 114 miles, but I not only enjoyed seeing the John Day Fossil Beds, I found the whole drive interesting and exciting). 1,583.3 10:28 Leave Dave’s and Elsa’s. Today I’m going from Yakima to Vancouver and have just left from the Arco gas station with a full tank before getting onto US-12. It is a glorious sunny day. It was wonderful seeing Dave and Elsa, and what a surprise it was that Sarah and Dan were in town as well. Sarah prepared the supper last night and Dan barbequed the pork chops, a very nice meal and wonderful being with dear friends. Also we all went to a party at Liz’s place last night, so it was quite a visit. 1,587.8 10:44 Junction with I-82. 1,590.5 It is a clear day and Mount Rainier is showing up above the mountains to the left. 1,593.4 I can see Mount Adams in the rear vision mirror. 1,597.0 10:52 - 10:58 Rest Area - pictures of both Mount Rainier and Mount Adams. 1,610.0 I can still see Mount Rainier sticking up above the closer hills. If one didn’t know better you would think it was a cloud because it’s absolutely white like a cloud. 1.611.7 Manastash Ridge, El. 2.672 feet and that was the last view of Mount Rainier from this road as it starts to descend to the valley where Ellensburg is located. As I round a bend in the road I can see the patches of snow on the Stewart Range. The air quality is not very good, but in spite of this the valley is beautiful with it’s patchwork of orchards and crops - a beautiful view coming down from the Manastash range between Yakima and Ellensburg. The air quality really is quite awful. 1,614.4 Starting to pass an orchard. Over the years I’ve noticed that the orchards have been climbing up the hillsides a lot higher above the valley. 1,620.9 11:19 Junction with I-90 to Seattle ... 109 miles, I think - the sign was hidden behind a truck. 1,623.2 A heron in flight. 1,631.1 11:27 Seattle 100 miles and I did see that sign. I am wondering how many times I have driven this route between Yakima and North Vancouver, but I think I’ve lost track because some years it has been several times in one year. I don’t know when the first time was, I think 1993 when LP and I came from the Washington coast over through Olympia and Auburn and joined into this highway just before North Bend. Yes, ‘93 would have been the first time. 1,658.0 A train going in the opposite direction out to my left. I don’t recall ever having seen a train coming through here before, although I have noticed the rail lines. I’m not sure how they get through the mountains from Seattle. 1,671.0 12:00 Noon on the fourth day and I’ve done 1,671 miles since leaving home! 1,674.2 Entering the snow tunnel. There has been, in previous years, rock slides which have blocked the road, so now they try and protect it by having the wire netting and special fencing in other areas to stop rocks falling on the road. 1,675.0 Road work the next 5 miles. 1,676.7 The end of the lake and there appears to be a lot more water in it then I have seen in many years. 1.679.3 12:07 The exit for Snoqualmie Pass, that is Snoqualmie Recreational Area. 1,681.8 I can see the road on the other side of the valley, the road for traffic in the opposite direction, but above that I can see what looks to be the railway line. Maybe it goes through a tunnel. 1,691.0 I can see where the train line is going around the mountain above me to the left. 1,694.0 I can see bridges across ravines, bridges for a train line that is. 1,700.0 Passing Exit-32 and more or less out of the high mountains now - there’s still some mountains but not the high rocky ones any more. 1,703.5 12:27 Seattle is still 30 miles. 1,704.3 12:28 Two hours since I left Dave’s and Elsa’s. Issaquah the next three exits - Issaquah is at the foot of the mountains. 1,715.0 Speed reduced from 70 mph to 60 mph and I think this is pretty much the speed now until we’re clear of Seattle. It was 65 mph over Snoqualmie. 1,723.4 12:44 Leaving I-90 at Exit-10 for I-405 north. 1,740.5 Sign: End of apple maggot quarantine zone. Do not transport home-grown fruit beyond this point. 1,743.0 1:03 Leaving I-405 for I-5 north to Vancouver. I just need to see Mount Baker today and I will have seen all the high mountains. 1,755.4 1:15 The traffic has been moving along very well throughout Seattle, but now we’ve come to a halt and then moving forward slowly. 1,767.7 Start of 70 mph. A rest area in half a mile. 1,768.2 Leaving the highway at a Rest Area. 1,768.6 1:31 - 1:43 Rest Area. 1,769.1 1:45 Back on the interstate. 1,777.7 91 miles to Vancouver BC. 1,808.8 A lot of fireweed blooming. 1,811.6 2:22 Bellingham the next 7 exits. I doubt that I’ll be seeing Mount Baker today, as there seems to be a lot of cloud on the horizon. 1,827.8 A deer coming out of the woods at the side of the road looking to run across the road, I don’t know about his chances of doing so with the amount of traffic. It stopped just off the edge of the shoulder. Lots of fireweed has been blooming all along the way. 1,838.1 2:44 Leaving I-5 at Exit-275, get gas and go to the Duty Free before crossing into Canada at the Truck Crossing. 1,839.6 3:07 Stopped waiting to get through customs. Back along the highway, there was a lighted sign that it was a 5 minute wait at the Peace Arch, 40 minutes at the truck crossing. I knew I needed to get gas, and I wanted to go to the duty free, so I thought, “Well , I’ll make up for the time I have to wait at the border by not having to drive through downtown Vancouver.” However, the line is flowing fairly quickly and I think that 40 minutes was greatly exaggerated, but we’ll see. 1.839.6 3:14 Through Customs. Next stop North Vancouver. Since it’s almost a year since I was here it will be interesting to see how much progress has been made on this road through to BC-1. Well, the road is finished all the way up to BC-10 and it’s over the railway bridge in Cloverdale. What a difference this road being done makes to the trip up from the border! It is finally two lanes each way with a big concrete New Jersey barrier down the center. 1,853.1 3:36 On BC-1. Even being a Saturday, the traffic is absolutely horrendous here in BC - on the main road just crawling along stop go stop go. 1,856.0 3:44 Start of the descent down to the Port Mann Bridge. There are numerous signs about the Port Mann Bridge - Highway 1 construction 2008 to 2013 - new cycling over the Port Mann bridge and beyond whatever that might mean! New Port Mann bridge reducing congestion and improving transit. Another sign construction 2008 to 2013. 1,857.0 3:47 This is just before going onto the bridge. Can’t really see anything, I think they must be building another bridge. Once over the bridge the traffic eased up a lot. All sorts of construction sign along the highway to improve getting across the river and the Port Mann area. 1,873.5 I’m on Anna’s street now and among the tall trees - it is quite dark.